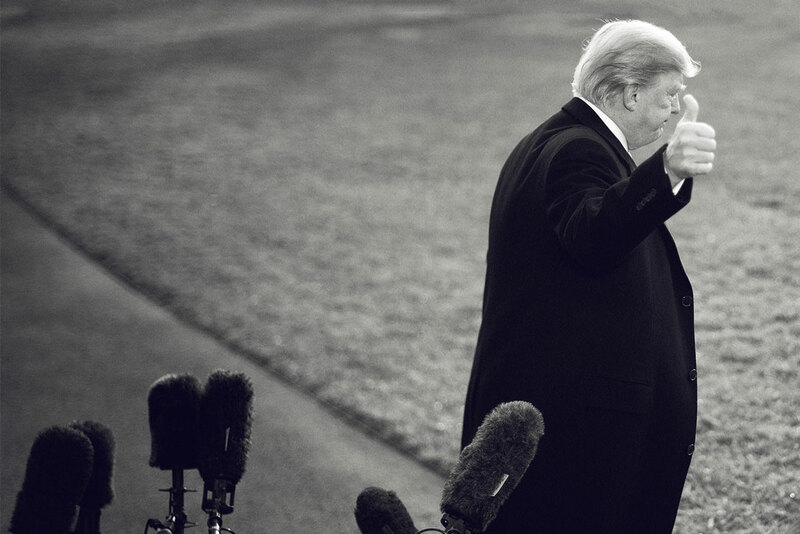 U.S. President Donald Trump gestures after making a statement to the press on December 4, 2017, at the White House in Washington, D.C.
A new era of presidential scandals creates opportunities for far-reaching reform. Many commentators have compared the Trump administration to the ill-fated presidency of Richard Nixon.1 The similarities are striking: a willingness to tap into the darker currents of the American political climate, a disregard for the rule of law, and an overriding concern with settling political scores and damaging perceived enemies. As special counsel Robert Mueller’s investigation continues, along with parallel investigations into other potentially illegal activity by President Donald Trump and his associates, it is already apparent that the Trump presidency will also be marred by scandal.2 Given these parallels, it is instructive to look at the reforms of the post-Watergate era when considering lessons for policymaking in a post-Trump world. The post-Watergate reforms were far-reaching. They sought to restore faith in the U.S. political system by combating the corrupting influence of money in politics; promoting ethics and transparency in government; protecting people against abuses of government power; and limiting certain extraordinary exercises of presidential authority. Laws passed in that period have transformed, among other things, the federal budget process, government practices for protecting individuals’ personal information, and oversight of the intelligence community. While these reform efforts have not been uniformly successful, they reflect the resolve of the policymakers of that era, who had a broad understanding of the abuses that needed to be addressed and who were willing to take broad actions to address them. This era of reform demonstrates at least two important lessons that apply to current efforts to prepare the post-Trump policy response. First, the post-Trump moment will likely present opportunities for significant reform across a broad range of policy areas, allowing policymakers to tackle deeply rooted problems that have previously proven difficult to address. Second, it is critical that policymakers begin planning now how to connect the wide-ranging scandals of the Trump administration to appropriate reforms. In less than two years, the Trump administration has created and exacerbated a broad range of problems. Trump’s corrupt use of executive power presents a threat to the rule of law and the democratic norms that have made the United States the most successful nation in the world. President Trump and his allies have undermined America’s standing in the global community,3 vilified marginalized communities,4 attacked civil society and other public institutions,5 and been complicit in brazen acts of corporate corruption.6 Yet Trump’s blatant abuse of power has also focused attention on long-standing practices that have undermined the American political process and skewed it toward the politically connected at the expense of everyone else. By bringing these pernicious problems into the spotlight, President Trump’s misconduct has created an opportunity for more significant reform, if there is sufficient political will. This report details some of the most significant post-Watergate reforms, providing an example for policymakers in the post-Trump era. Like their post-Watergate predecessors, policymakers must be ready to seize the opportunity to advocate for bold responses that do not just restore the prior status quo but also make fundamental positive changes. In the absence of those changes, the country risks recurrences of this kind of administration, where a corrupt demagoguing president rigs the system for himself and his friends while seeking to misuse the levers of government in order to maintain power. While contemporary coverage of former President Richard Nixon focuses on the Watergate burglary and cover-up that ultimately led to his resignation, the Nixon administration was rife with unethical and undemocratic conduct. Secret and potentially illegal use of military force,7 illegal campaign contributions,8 domestic spying,9 outright bribery,10 and the misuse of the machinery of government to attack political opponents11 were just a few of the widespread abuses discovered by the Watergate investigators and subsequent congressional inquiries. Unsurprisingly, an administration led by a dishonest and unethical chief executive—with little respect for the rule of law—was prone to abusing its power. The breadth of Nixon’s abuses was matched by the subsequent response. Although the post-Watergate period is widely understood as an era of reform, over time, the full extent of the changes has faded from view. The 1970s saw a wholesale remaking of America’s campaign finance system, including the creation of the Federal Election Commission (FEC) and the introduction of comprehensive limits on how much money political campaigns can raise and spend.12 There were also historic new protections against abuses of executive power, including the Privacy Act—which restricted government use of personal data—and the Foreign Intelligence Surveillance Act (FISA), which created a process to limit the power of intelligence agencies to spy on American citizens.13 The era also saw changes to congressional budget procedures, an effort to limit foreign military interventions overseas, civil service and ethics reforms, and much more. Broadly, these reforms sought to provide for a more ethical, transparent government; combat the corrupting influence of money in politics; protect people against governmental abuses of power; and place limits on extraordinary exercises of presidential power. The following sections provide a brief overview of the extensive reforms put in place in response to Nixon’s abuses of power, some having been enacted while he was still in office. While the descriptions of these reforms are not intended to be exhaustive, they provide a sense of the breadth of the response and provide an example for current policymakers. Then-Chief Justice Earl Warren wrote, “If anything is to be learned from our present difficulties, compendiously known as Watergate, it is that we must open our public affairs to public scrutiny on every level of government.”20 It was in this vein that Congress passed two separate laws to enhance government transparency. The first of these laws, the Federal Advisory Committee Act—enacted before Nixon even left office—sets out rules requiring certain processes for federal advisory committees “to ensure that advice by the various advisory committees formed over the years is objective and accessible to the public.”21 It provides people with a window into whom the government is listening to when setting policy. The Civil Service Reform Act was the most sweeping reform to the federal civil service since the Pendleton Act of 1883.31 It established three new federal agencies: the Merit System Protection Board, the Office of Personnel Management, and the Federal Labor Relations Authority.32 These agencies oversee the management and regulation of civil servants. The act also simplified and reorganized the appeal process for adverse personnel actions such as firing or demotion; set out a new system for performance-based pay and promotion; and strengthened protections for whistleblowers against reprisal for revealing government misconduct. The basic pillars of the act continue to serve as the foundation for the modern civil service. The 1974 amendments to the Federal Election Campaign Act (FECA) responded directly to the abuses of the 1972 campaign. Although the 1972 version of the act focused principally on disclosure and established no central enforcement authority, the 1974 amendments, enacted after the release of the final select committee report, created the FEC and introduced comprehensive limits on contributions to and expenditures by political campaigns—a radical change in the way that American politics was financed and conducted. Some of the FECA’s provisions have since been weakened or struck down by U.S. Supreme Court decisions, but many have persisted for more than 40 years. Today, all candidates, political parties, and political committees are subject to strict contribution limits and must disclose every dollar raised and spent. During the Watergate investigations, prosecutors determined that numerous corporations and corporate executives had made illegal contributions to Nixon’s re-election campaign.51 Those investigations also revealed that companies had been creating secret slush funds to make a range of illegal payments, including bribes to foreign government officials.52 Investigations into these practices by the Securities and Exchange Commission and the Senate Subcommittee on Multinational Corporations revealed several cases of foreign bribery or improper payments made by major American companies.53 Buoyed by a post-Watergate focus on ethics, these revelations created significant pressure on Congress to act. The Foreign Corrupt Practices Act addressed this issue by making it illegal for covered individuals and corporations to bribe foreign government officials in order to obtain or retain business. It also imposes accounting standards on companies—thus ensuring that they accurately record their transactions—and prohibits knowingly falsifying records. The Watergate investigation revealed that Nixon had sought to use private tax information held by the IRS to damage political opponents and had continued the long-standing practice of illegally surveilling Americans through the FBI.55 Concerns about governmental misuse of personal information led to demands for clearer standards and protections. The Privacy Act sets standards for how agencies collect, maintain, use, and disseminate people’s personal information. Agencies are required to establish a secure system to prevent unauthorized disclosures of information.56 They are limited to using individuals’ information for legitimate purposes and are prohibited from disclosing individuals’ information without written consent, except in a limited set of circumstances.57 The act also creates a means for individuals to seek access to their information, which is in the possession of agencies, and to amend such information when warranted.58 In practice, the act’s exemptions for law enforcement and national security have created large gaps in its protections; however, it was key in establishing limits on what the government can do with the personal information it collects. The Watergate investigation and a subsequent investigation by the Senate Select Committee to Study Governmental Operations with Respect to Intelligence Activities—also known as the Church Committee—revealed widespread abuses by intelligence agencies, including extensive domestic surveillance by the FBI and the CIA.64 In response to these investigations and other revelations about domestic surveillance, Congress enacted FISA, which limited electronic surveillance of Americans to national security purposes. The War Powers Act was intended to limit the president’s power to initiate hostilities without prior congressional authorization. It did so by setting up a system of time limits and required reports to Congress. From the beginning, the act was criticized as being both too restrictive and too permissive of executive branch action. While it has rarely operated to provide an adequate framework for decisions about whether the United States should go to war, over time, it has operated to require presidential notification to Congress. One of the most important lessons from the Nixon era is that a corrupt president creates a culture of corruption that permeates the whole administration, resulting in wide-ranging misconduct. A president who is dishonest and unethical and who puts a premium on personal loyalty will fill his administration with dishonest, unethical loyalists. This leads to a proliferation of corruption and abuses of power; the abandonment of long-standing norms that are critical to a well-functioning political system; and even criminal activity. Ultimately, the result is a multitude of scandals, which creates a multitude of opportunities for policy changes. Just as in the post-Nixon era, if policymakers are prepared, efforts to address these Trump administration scandals have the potential to be wide-ranging. Now is the time to start thinking through the full range of potential changes—not just ethics and political reform proposals but also changes to strengthen the rule of law, bolster civic institutions, and address economic and social marginalization. The second lesson from the post-Watergate era is that public understanding of the nature of a corrupt president’s scandals will shape which areas are deemed in need of reform. While the post-Watergate reforms were far-reaching, they generally tracked and responded to the specific problems discovered by the post-Watergate investigations and the resulting public concerns about abuse of government power. The War Powers Act, for example, was a response to President Nixon’s secretive use of military power. Both the Inspector General Act and the Civil Service Reform Act responded to concerns about Nixon’s misuse of government power and personnel, including to attack political enemies. And the Foreign Corrupt Practices Act was the result of the unexpected discovery of corporate slush funds used for foreign bribes by some of the same corporations that had been making illegal political contributions. Indeed, many of the laws now identified with good government were enacted in the wake of the Nixon administration. Importantly, reform legislation did more than simply address Nixon’s personal misconduct. Congress utilized the opportunity to address long-standing problems that were far bigger than one individual. Yet their efforts were largely grounded in the recognized abuses of the Nixon administration. Therefore, in preparing a response to the Trump administration, policymakers must consider how the nature of his scandals will affect the range of potential policy responses. Situating President Trump’s scandals in the context of broader structural problems within the political system will allow for more far-reaching policy responses that address deeply rooted problems. The United States is currently confronted with an administration that not only ignores democratic norms but also looks upon them with open disdain. The brazenness of this administration’s corruption presents a unique opportunity to draw public attention to how the current rules skew the system toward those with political and economic power. In turn, this can help build support for policymakers to take steps to rewrite those rules so that the system is more responsive and accountable to all Americans. Just like the Nixon scandals, the misconduct of the current president may set the stage for an ambitious new set of democratic reforms, a once-in-a-generation opportunity—if policymakers are prepared to embrace it. Sam Berger is the senior adviser at the Center for American Progress. His areas of expertise include health care policy, government reform, regulatory policy, appropriations, and administrative law. From 2015 to 2017, Berger served as a senior policy adviser at the White House Domestic Policy Council, where his work focused on the Affordable Care Act and Medicaid. From 2010 to 2015, Berger worked at the Office of Management and Budget (OMB) in various roles, including senior counselor and policy adviser. Alex Tausanovitch is the associate director of Democracy and Government Reform at the Center. He previously served for four years as counsel to commissioners on the Federal Election Commission—including for three previous chairs of the commission—and has published papers on lobbying and campaign finance. Prior to joining the Center for American Progress, Tausanovitch worked at the Department of Education’s Office of Federal Student Aid, where he helped establish a program to provide student loan relief to borrowers who were subject to unlawful deception by their schools.